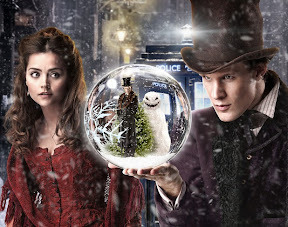 Home » bbc , doctor who , science fiction , television , the snowmen » "The Snowmen" is blowing every DOCTOR WHO fan's mind right now!! You're a better person than I am, because I just watched the Christmas special, and I feel some parts dragged, other parts were rushed, and overall, it simply made no sense. There again, Doctor Who doesn't make any sense half the time anyway. I do like the new companion, mostly because she's spunky and hot. The Sontarran (sp?) was kind of funny with his over-zealousness. And, it was interesting to hear an invisible Magneto inside a snowglobe. While I'm glad that Clara brought The Doctor out of his funk, and I wouldn't have expected otherwise, I think he still came out of his funk a little too easily. Frankly, I wanted to see him even more Scrooge-like over the loss of his beloved Amy & Rory Pond (uh, Williams). Being the atypical, not-really-a-true-fan follower of Doctor Who, the main appeal to me in recent seasons were the Ponds (eh, Williams), and I even skipped half a season of them. So, Clara/Oswin has big shoes to fill. This was a Christmas special: it could,be, nay, needed to be a little extra on the fun side. We got that. But we also got the Doctor totally unlike anything we've seen in this show's entire run, much less a Christmas special. What really brought him back into action was Clara, realizing that "hey this is a mystery I need to figure out!"